Follow these steps to upload a document (such as a syllabus, course schedule, article, etc.) to a content area in Blackboard. 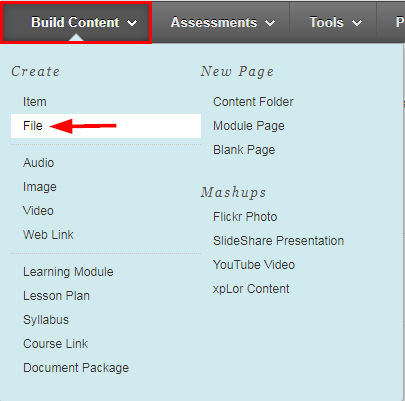 Navigate to a content area using the course menu. Roll your cursor over Build Content and then click File. Enter a Name for the file (for example, “Syllabus”). This is what the student will see and click in the course. For Find File, click the button Browse My Computer and open the desired document. If you have already uploaded the document to your Content Collection, click Browse Content Collection and then choose the desired document. TIP: The recommended file type for uploaded documents is PDF (ends in .pdf). PDF files are easiest for students to open and provide the best experience on most devices, including computers, tablets, smartphones, etc. If you would like the document to open in a new window, click Yes for the Open in New Window option. To make the document available for students to view, click Yes next to the option Permit Users to View this Content. To track the number of times the document is viewed, click Yes next to the option Track Number of Views. To allow the document to be available for a date/time period, select the check boxes Display After and Display Until, and then enter the dates and times for the document to be available. TIP: To make the content available until the end of a day, enter 11:59 PM in the Display Until field. Entering 12:00 AM can cause the content to become unavailable an entire day sooner than you intended.